With only two days to go until our Memories and Memorabilia Day the Friends of Moseley Road Baths and our oral history volunteers are going into overdrive to ensure that all our visitors come away with that warm glow that we’ve managed to achieve in previous years! Last night we finalised a lot of our displays after hours and hours spent going through our oral history audio recordings. I’ve been putting some of the best snippets together for visitors to have a listen to. Meanwhile I know that others are leafing through memory sheets, laminating stuff, mounting pictures, and in the case of the group from The Victoria Baths in Manchester plotting their trip down to deliver their talk… and you know what? It’s so exciting to be a part of it and to have the chance to share all of these fabulous memories with everyone! There are some real gems, I particularly like this one of local pupils on the campaign trail! If you haven’t already told your friends and family, made a note in your diary, spoken to that elderly neighbour who you know just LOVES local history, then do it now!! Drop me a line at memories@friendsofmrb.co.uk if you want me to send you flyers or more information. 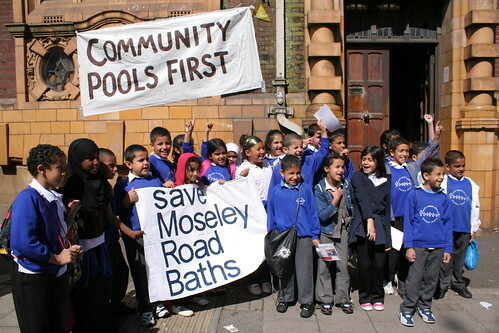 If you want to join one of our three tours of Moseley Road Baths, including many areas that are currently completely sealed off to the public, you will need to book your place to guarantee a spot. Again, drop me a line or ring 07967 093 256 and state whether you want to join us at noon, 1pm or 3:30pm. All tours leave from Mary Street Church Centre on the junction with Edward Road. Be prepared for stairs and uneven surfaces! The Friends of Moseley Road Baths group will be providing light refreshments, but as with previous years we encourage anyone with baking skills to add to our array of homemade cakes! There’s something about a slice of cake and a cuppa that really gets people reminiscing! We are really keen for those amongst you who swam, washed, worked, dived or danced at the baths to add your own memories (and memorabilia) to our growing archive by recounting and possibly recording your stories to our oral history volunteers who will be on hand for just this purpose. Come prepared! Finally, just in case you are unsure of directions, here’s a handy map! There is limited car parking at the venue (access on Mary Street), with some additional on-street parking.